Should the Knicks Trade for Kemba Walker? Last week, the Charlotte Hornets said they would be willing to trade their starting point guard, Kemba Walker. The Knicks are in need of a point guard and are still trying to figure out if they are a win-now or a rebuilding team. One might ask, should the Knicks trade for Kemba Walker? Although Kemba Walker is a star point guard, he’s in a league with a lot of star guards and does not get the recognition he deserves. He averages about 22 points, 6 assists, 3 rebounds and 1 steal per game. The Charlotte Hornets reportedly want an all-star caliber player in return. Unfortunately, the Knicks cannot provide that. Therefore, they would need to take on a bad contract or give up a draft pick to acquire Walker. While those two scenarios do not sound appealing given the state the Knicks are in, they should consider giving up a future pick. They do not use draft picks well anyway, so what’s the point of having them? Just ask Dennis Smith Jr., Malik Monk or Donovan Mitchell. The Knicks should explore dealing Frank Ntilikina, Willy Hernangomez and Kyle O’Quinn. The Hornets would certainly want Ntilikina and possibly one of the two centers. However, they would want a draft pick, due to the fact that the Knicks would not want to take on a bad contract since they already have to pay Joakim Noah $54 million for 3 more years. The Knicks should offer Courtney Lee in an attempt to hold onto a draft pick. However, if the Hornets do not budge, they should give in. The Knicks should focus on winning now, rather than tanking. A team with Kristaps Porzingis, Enes Kanter, Tim Hardaway, Jr., and Walker could certainly make the playoffs and attract free agents, independent of James Dolan’s negative effect on free agents. They have not had an elite starting point guard since…well, it’s been a while. Having Walker as a second option could allow Porzingis to speed up his development, play a 2-man game, and lower his shot count. A real point guard could significantly help the Knicks in a guard driven league, and they should absolutely consider trading for the 6-year man out of UCONN. Do you want to see Walker on the Knicks? About Me: I’m Spencer Alexander Zied, a freshman at the University of Miami from New York, New York. I love to play basketball and tennis and am a big fan of the Knicks, Giants, Yankees and all U. Miami sports. I’m also a big fan of First Take and Sportscenter on ESPN. You can email me at spencer.zied@gmail.com or connect with me on Twitter, on Facebook, or on Instagram (szied713). Did the Knicks Phil Their Holes? The New York Knicks have not been very good the last couple of seasons. We all know this. Phil Jackson has been constantly ridiculed for “not doing enough” in free agency, especially due to his 5 year, $60 million salary. However, this summer, things have been a little bit different. Out of nowhere, the Knicks acquired Derrick Rose from the Chicago Bulls. After years of struggling with subpar point guards including Chris Duhon, Raymond Felton (in his second stint) and Jose Calderon, they couldn’t find a good player to fill the position. Of course we know Rose has had his share of injuries over the last few years. But he only has one year left on his contract and hopefully can stay healthy. In exchange for Rose, the Knicks gave away some Doritos, a plain bagel and a box of Cheerios (Jose Calderon, Jerian Grant and Robin Lopez). While Rose’s injury woes are a major concern last season he played 66 games and averaged about 16 points and 5 assists a game. While he is not the MVP he once was when he averaged 25 and 8, I still expect solid production out of him assuming he stays healthy. I believe playing with Carmelo Anthony will force Rose to defer more often than not, creating more opportunities off the ball for Rose as well as setting up Carmelo for open jumpers. Have you heard the phrase, “When one bull comes, the other bull follows?” Joakim Noah has, signing with the Knicks for 4 years and $72 million. I am a huge fan of this guy, and I think now that he is home, we will see what we saw from him before Fred Hoiberg came to Chicago. Now while he is up there in age at 31, he is 6’11” with 9 years of experience under his belt While last year he only averaged 4 points and 9 rebounds a game in an injury plagued season, those stats should be taken with a grain of salt, as he is probably the hardest working NBA player there is, if not top 5. He is not the most offensively skilled player, but on defense, loose balls and rebounding, he is there night in and night out. His injury woes have hindered his performance over the last couple of years, but in the 2013-14 season he played 80 games and averaged about 13 points, 11 rebounds and 5 assists a game. With a career shooting percentage just under 50%, I do not worry that Noah will take too many shot attempts away from Carmelo Anthony or Kristaps Porzingis. Signing with his 7th team in 8 years, Courtney Lee looks to have an immediate impact on the Knicks. At 6’5” and 30 years old, he is definitely an upgrade from Aaron Afflalo who was signed to a one year opt out deal which thankfully, he opted out of. While Lee is a very solid player, his numbers are nothing glamorous, yet he provides solid offense and defense and is not being heavily relied on to “carry the load” by any means. The most intriguing signing for the Knicks is Brandon Jennings for $5 million over this season. Jennings was drafted in 2009 by the Bucks and was then traded to Detroit. He has been a productive player ever since Reggie Jackson took his spot in Detroit. He was then traded to Orlando last season where his numbers dramatically took a fall. However, this does not concern me and here is why. Jennings is an extremely talented player who has always had a role on his team. In Orlando, he was ignored behind Elfrid Payton. He has had constant pressure since Milwaukee to perform, which he has failed to do. However, in Milwaukee he had no pressure on him because he did not have a viable backup behind him. This time, he is the backup. While injury is certainly a concern for Jennings, he was extremely excited to sign with the Knicks and I expect that to translate to the court this season. Finally, he is certainly an upgrade from Langston Galloway, who never really found his role on the team. The Knicks additionally retained key role players such as Lance Thomas, Kyle O’Quinn, Sasha Vujacic and signed 26 year-old Mindugas Kuziminskas, from Latvia who knows Kristaps Porzingis and 22 year-old Guillermo “Willy” Hernangomez from Spain who shows a lot of potential. Last but not least, they hired Jeff Hornacek, the former head coach of the Phoenix Sun’s. The team’s performance was unimpressive under Hornacek, but other than Eric Bledsoe, there was little talent to work with. While Mark Jackson would have been my pick, anyone is better than Derrick Fisher… even Matt Barnes. So what are reasonable expectations for the Knicks this season? If the Knicks are fully healthy for 85% of their games, they should obtain anywhere from the 5th to 8th seed in the Eastern Conference standings. They have enough talent to be competitive, yet they are not better than the Cavaliers, Pacers, Celtics or the Raptors. While the Pistons, Bucks and Wizards pose a threat, the Knicks upgraded more in the offseason than either of those teams. However, if they are not fully healthy and have at least two starters out for more than 40% of their games, they could very well miss the playoffs. The main takeaway should be positive from this offseason. While Rose, Lee, Anthony, Porzingis and Noah are not the Dream Team, they are still better than Calderon, Afflalo, Anthony, Porzingis and Lopez last year, who won a mere 32 games. And while some may be upset about Durant, Wade and Howard going to other teams, the hopes and dreams of the Knicks signing them were for the most part unrealistic to begin with. I hope this season is competitive! Go Knicks! About me: I’m Spencer Alexander Zied, a rising 12th grader from New York, New York. 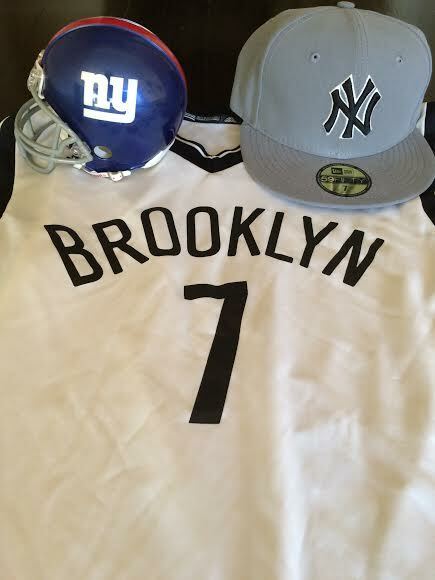 I love to play basketball and tennis, and am a big fan of the Knicks, Giants, Yankees and the Oregon football team. I’m also a big fan of First Take and Sportscenter on ESPN2. You can email me at spencer.zied@gmail.com or connect with me on Twitter, on Facebook, or on Instagram (szied713). As the NBA season winds down, a champion will be crowned and the free agent pool will fill up. One of those soon to be free agents is Kevin Durant—an elite scorer, a superstar and an MVP-caliber player. Despite his many accomplishments, he has yet to earn a championship ring. After going up 3-1 this year in the Western Conference Finals, the Warriors won games 5 through 7 to close out the series and leave the Thunder in shambles. In game 6, Kevin Durant certainly deserves at least some of the blame for the loss as he performed very poorly along with his running mate Russell Westbrook. This left the door open for many questions, especially now that KD will be a free agent. But the biggest question right now is, where will he go? Below are some possible best and worst fits for Durant as I see it. Even though the Thunder blew a 3-1 series lead, Billy Donavan is an excellent coach and Sam Presti a phenomenal GM. Although KD and Westbrook don’t have the best chemistry, they are both top 5 NBA players without a doubt and that is definitely something that can elevate Durant’s chances of obtaining a championship. The only good reason KD should stay in OKC is if the Thunder signs a true point guard like Mike Conley in the offseason. While Westbrook is a terrific player, he is often reckless with the ball late in games and needs someone to handle the ball late like James Harden could before he was traded. Furthermore, sometimes Westbrook’s bad habits rub off on Durant, as we saw late in the Western Conference Finals this year. Not the worst thing to stay, but not the best either. To win a championship, you have to know how to win. That’s something Chris Bosh and Dwyane Wade certainly know how to do. The Heat have a very good set of talent, yet D-Wade is not the same superstar he used to be, and KD would be the perfect player to fill that void. With Hassan Whiteside and Goran Dragic, KD would cement the Heat as an immediate title contender, similarly the way Lebron James did when he joined the team in 2010…not to mention they made 4 straight finals with him and won 2. They also have a solid group of role players, definitely better than KD has now in OKC. While this may not seem like the most glamorous destination for KD, Terry Stotts has proven to be a terrific coach and Damian Lillard has proven to be a superstar. After losing 4 starters, C.J. McCollum stepped up and the Trail Blazers made the playoffs in the western conference and won in the first round. Most teams that lose 4 starters would not even make the playoffs, let alone win a round. This team is young, fired up and waiting for a couple of pieces to come their way and cement them as a title contender. The combination of Lillard and KD would be lethal, and it would likely seem reminiscent to the OKC team that made the finals in 2012. Brad Stevens has proven to be a very good coach as the Celtics continue to make the playoffs each season. With a strong group of guards in Thomas, Bradley and Smart and a group of young talented role players, KD would certainly be a great fit as a leader who could guide the younger players to capture a ring. There are better possible destinations, but don’t rule Boston out. Andrew Wiggins. Karl Anthony-Towns. Zach Lavine. How much fun could KD have up in Minneapolis with these three high flying, rising NBA stars? With a scorer like KD on this squad, he could take attention away from those three, thereby helping those guys have a bigger impact on the game. While these three are talented, they do not yet know how to win in the NBA, and KD could definitely show them the ropes and we could see some Harlem Globetrotters-type heroics if KD signs up. Why would anyone go to New York? The franchise is a complete mess; however, KD is very fond of 7’3” Kristaps Porzingis as well as Carmelo Anthony. With a scoring duo like KD and Melo, two of the top 5 NBA scorers, how could they be stopped? While they’d be exciting to watch, I’m not sure the Knicks would become a title contender—but the team would certainly better than it is now. While I’m hopeful, I don’t see this nor would recommend this to KD for his own sake. However, I would recruit him hard and accept him with open arms. Who knows what the Zen Master could do? Champions, yes. Now if KD went to the Warriors, who would be the best on the team? Would there be tension between Curry and Durant? Would they need to lose Klay Thompson in order to obtain Durant? The infinite questions make this a questionable call. While the Warriors certainly shouldn’t deny KD if he wants to join, I don’t like the idea of Durant joining a team after they beat him. I don’t like the idea of two superstars teaming up by way of free agency—they would either be too dominant or there would be too many issues. Sounds like someone we know… anyway, I feel like KD won’t want to go to the bay area this offseason. But if he did, the Warriors should do whatever they ccan to get him. This is a great franchise with a great coach. However, KD’s own team just eliminated this team in the semi finals, so why join someone you beat? It’s a lateral move from OKC, and it’s not always easy transitioning to play with the Spurs from another team (just ask LaMarcus Aldridge). However, if KD did join the Spurs, Kawhi Leonard could go back to playing power forward like he did in college or KD can play the two. Please, no. Yes, LA is a wonderful city with great food, nice cars, and bright lights. If he really loves LA, he can go there during the summertime or when he retires. Not now. No. Please don’t go, KD! This has been reportedly out of play, but DC is where KD grew up so maybe nostalgia will kick in and he’ll play for the Wizards. Other than that there is a pretty low chance he will sign with them. John Wall is great and they’d work well together. Beal and KD would be entertaining together, though Beal’s injury is concerning and the Wizards lack of talent off the bench would be a downgrade from OKC. As you know, James Harden played with KD on OKC and, together, they made the finals! But don’t ask KD whose fault it was that they lost…I think we all know who pulled the disappearing act. The Dwight Howard/ Mike D’Antoni part two will be comical and entertaining, however I don’t think KD needs nor wants to be part of a reality show in Houston. Stay far away from Houston, please. While James Harden is a super talented player, he is not a winner by any means and he and KD would play off of each others’ bad habits similarly to the way Westbrook and KD occasionally do in OKC. James Harden is also a loser, and, like Westbrook, he would dominate the ball too much. Are New York Sports Teams Going Down the Drain? Over the last year, New York sports teams have been a shell of what they once were, causing stress and anger among its fans. In the MLB, the New York Yankees and New York Mets missed the playoffs this season and it wasn’t pretty. The Yankees lost a lot—Robinson Cano went the Mariners, Alex Rodriguez was suspended, and Mariano Rivera retired. It doesn’t seem like the bleeding for the Yankees will stop anytime soon, especially after they lost their 20-year captain, Derek Jeter. In the NFL, the New York Giants and the New York Jets have combined for five wins so far this season—that’s as many wins as the Buffalo Bills have achieved this season with Kyle Orton as their starting quarterback. The Giants have had many injuries, especially among their starters including Victor Cruz, Rashad Jennings and Prince Amukamara. The Jets have had a lot of quarterback changes, and have finally sidelined Geno Smith for Michael Vick, who on Sunday led them to their first win in two months. Their secondary is relatively empty and that has hindered the progress of their entire defense. In my opinion, the general manager of the Jets, John Idzik, is mainly to blame due to the fact that he did not go after big name defenders—their biggest weakness. In the NBA, the New York Knicks haven’t been impressive either. Although they resigned star forward Carmelo Anthony, they still have a void of surrounding talent. With Derek Fisher as its new coach, the Knicks have struggled mightily in the triangle offense, so much that the commissioner even took a shot at their horrendous play. Due to their lack of talent and everything associated with them, they have been awful. They traded for a new point guard in Jose Calderon. However, he has been sidelined with injury and has not played yet. Ironically enough, the Knicks have beaten two hyped up machines—the Cleveland Cavaliers and the Charlotte Hornets. However, they still sit at 2-6 and do not look like they will get any better. As for the Brooklyn Nets, they sit atop the Knicks at 4-2 and have looked relatively good so far. Besides the Bills and Nets, who are a couple of games over .500, New York sports has been an absolute disgrace. Something needs to change quickly! Fans expect more and want what they want when they want it. As for the Knicks, they need to get Calderon back, and need to acquire a good interior defender who can also help out on offense such as Marc Gasol. They also need to shop J.R. Smith, Tim Hardaway, Jr.,, and Iman Shumpert in order to find value that we can use because all three shooting guards have similar strengths and weaknesses. They also need to develop Cleanthony Early into a productive NBA player. The Giants need to fire their defensive coordinator and acquire new, young talent on defense. At the end of the season, they also need to fire Tom Coughlin and acquire at least two new good offensive linemen. I’m still a fan of New York sports teams, especially the Knicks and the Giants. But I hope things change for the better, and soon, because it’s gotten ugly and painful and I’m not sure how much more I can take. Who’s to blame for the poor performance of (most) New York sports teams? Owners? Coaches? Players? Fans? Media? Weather? Check out some of my recent Second Take With Spencer A posts here. I’m Spencer (Alexander) Zied, a 10th grader from New York, New York. I love to play basketball, football and tennis, and am a big fan of the Knicks, Giants, Yankees, Oregon football and North Carolina basketball teams. I’m also a big fan of First Take and Sportscenter on ESPN. You can email me at spencer.zied@gmail.com or connect with me on twitter, on Facebook, or on Instagram (szied713).